I have a very sweet friend. She has been a friend of our family for over 20 years. Mrs. D. is a lively Southern belle who loves to bake goodies for my family. She will invite me over for lunch and we visit for the whole afternoon. Mrs. D's hubby died about 4 years ago, and it has been a lonely time for her. Her children and grandchildren live in different states, so it is hard for them to come very often. Last year I made this little quilt for her birthday. I made it from a fat quarter bundle that I found at the big cloth store. Thankfully I was able to obtain some closely matching fabric for the borders. Mrs. D loves to watch the Food Network and the Travel shows on cable. She tells me that she has traveled the world by watching these programs. And she loves the chefs that design new recipes. We often are the recipient of a new cake or cookie recipe that she has experimented with. She usually tells me she took a taste test and she did not think it was very good. When I bring the treat home, my family has it gone in no time flat. But that is her hobby now, esp since she had hip surgery a couple of years ago. It really limits her ability to walk very much. Her limited walking has not limited her heart. She can whip out a bowl of soup and a grilled cheese sandwich at the sound of the doorbell. Isn't it fun to go out in the spring time and plant flowers and veggies? We have not had a vegetable garden in several years, but this year my dear daughter wanted to plant one. My dear sweet husband made two raised box beds, filled them with dirt, and told her to go for it. We are looking forward to the fruits of her labor. And the flowers that I planted around the pond are starting to do their job and are blooming like crazy! The Pioneer Woman would be proud! I'll keep you posted on the progress of the vegetables. Five years ago, I attended my first major quilt show in Nashville with my two quilting buddies. We stayed at the Opryland hotel, which was hosting the quilt show. We entered the doors and could not believe how much there was to see. Rows and rows of vendors and some of the most beautiful quilts we have ever laid our eyes on. We attended two lectures given by Alex Anderson. What fun! By the end of the first day, we were on overload and headed back to our room. We brought out all of our bags and took out every item for close inspection. We would oooh!! and ahhh! with so much delight, stroking each others fabric and reviewing all of the books and patterns. For the next two days we enjoyed the euphoria of every quilting treat that was available. In the years since, I have attended the Quilt Festival in Chicago, and the AQS Quilt show in Paducah. Each one has its own unique spin on the quilting community. It's what drives the psychological part of our desire to make beautiful things. Whether it is art quilts or traditional, batiks or reproduction. The mere thought of a trip to a quilt show is enough to start my exit from reality. It is a mystery that once again brings me back to the reason why I quilt. For the beauty of it, and the love of experiencing what others have created in a world of fabric. My daughter learned how to crochet. Her fingers have been flying ever since she stayed the night with her grandmother a couple of months ago. Here she is working that crochet needle on her second project. The first one she completed was a gift for her friend who just had a baby. Look how pretty this is with the dainty blue ribbon laced around the edges. I never learned how to crochet, although my own mother made many very beautiful things. I have so enjoyed using some of the pieces that my mother made many years ago. It is a sweet reminder of her when I see her intricate designs. I am so glad my dear daughter has taken up this craft. It is a craft that has been special for both of her grandmothers. Today the mailman brought me a little prize! I won a prize from Kim at bitty bits & pieces. She was celebrating her blogiversary. I won the cutest pattern of a spring time basket. And last week I received a package from Heidi Kaisand from Hens and Chicks. She drew my name for a little "slice" of her fabric stash. She sent me five luscious flannel fat quarters. They are so soft and country looking. I will have to find a very special project for them. Thank you ladies for your very generous hearts. Enjoy a wonder filled day. What a beautiful way to welcome Spring! Enjoy a Happy Quilting weekend! Now if you can't have a quilted car, the next best thing is a giveaway! Check out bitty bits & pieces. Kim has been having a blogiversary party all week. And the last prize is a beautiful Table QUILT!! Check it out and make a comment on her blog site!! Also Ginnys Quilts is having a birthday giveaway. Wait til you see what wonderful prizes of tools and gadgets she has selected. out books from that library for elementary school. them for the maximum time allowed! local Library has available? You might be pleasantly surprised. Recently on a day trip to a nearby town, my sister in love and I came upon a little antique shop. We browsed through rooms of china, pottery, primitive and retro stuff. But in the back of this little shop were linens, quilts and other textiles. I spotted this wooden box on the bottom shelf. It was full of buttons, snaps, pins, and other sewing accessories. Of course I needed to add this to my sewing collection. Connie Colten has added my blog to QuiltQua , her new quilting directory which has many resources to explore. I feel honored that she would invite me to be a part of her new website. This is one of my first quilting projects. I started this quilt for my son when he was still a little boy. The quilt top was machine pieced, but I started hand quilting the sandwich. It took long evenings, working on it section by section with a large wooden hoop. I eventually put it aside. Four years ago, my son moved to Nashville to work with a ministry. We decided that we would drive him there. On the road, I continued to hand quilt in places that I had never finished. By the time we arrived, it was done "enough" to hold the center section well. Time moves on, and when our son returned home, the quilt came home with him. This winter, on an unusually frigid night, ds asked for his quilt. I unfolded the quilt and placed it on his bed. Just then, I realized that I never quilted the borders. So when the cold nights passed, and the thoughts of washing this quilt came to mind, I thought it might be helpful to add some quilting to the borders. My sister in love suggested that I just do some machine quilting on the borders. I considered it, but I do not want to take the binding off, as it has a bias binding. I never liked marking my quilts, after hearing some of the horror stories from other quilters. I recently tried a new fabric pencil by Sewline that I used when quilting my Bow Tuck Bag. But that was a smaller project. My biggest concern is that the borders are 2", 3", and 4" wide with the last two borders being dark, dark blue. I may end up cross hatching the borders and use masking tape as a guide. But it is a project that will get me back to hand quilting. It will be a labor of love. Quilts and Tea. My two favorite things. Quilting has been almost like therapy for me. I love the whole process. Well, almost the whole process. I like picking out the fabrics, cutting them up, and putting them back together in some kind of creative form! I think I heard once that people in Hawaii don't understand why we cut up a whole piece of cloth and then sew it back together again. And tea........ yes the comfort of tea. I have collected a fair amount of tea cups and tea pots. Probably enough to open my own tea room. But of course it would have to be a tea room with a Quilt shop attached! My dear sweet hubby bought this tea cart for me when we were on a trip once. We saw it in an antique shop and asked the owner about it. She told us that it belonged to her mother in law and she was downsizing. So my dsh bought it for me. I really love it! The tea service is one that my own mother in love painted. She is an awesome china painter. We have enjoyed so many of her beautiful things. They are family treasures. This little quilt is one that is rotated seasonally in my dining room. I love the bow shaped quilt holder and it is just the right size to display a small quilt. Perfect for my tea corner. If you have never enjoyed a piping hot pot of freshly brewed tea with a delicious cranberry scone, you are really missing a little bit of pleasure. If you would enjoy making the absolutely best scones in the whole world, please send me an email, and I will refer you to a tea site with the best scones recipe that you ever tasted. Back in January when my BFF from cold country came down to cottage paradise, we spent a day at the Tea house. This is how the "high tea" was presented. Isn't it just lovely? They were layered with cake, cut up strawberries and whipped topping. A Strawberry Shortcake ala tea room! So delicious, and so creative. Who would have thought to serve strawberry shortcake in these precious little cups? So if you have any little cups just hanging around, even if the saucers are long gone, make up a batch of cake, add some sliced strawberries and top it off with whipping cream. You will be the hostess with the mostess by serving these little gems at your next tea party or quilting bee. I won a prize!! When I got home today, there was a package peeking out from the mail. It was the prize I won from a giveaway. JoAnn over here had a giveaway. 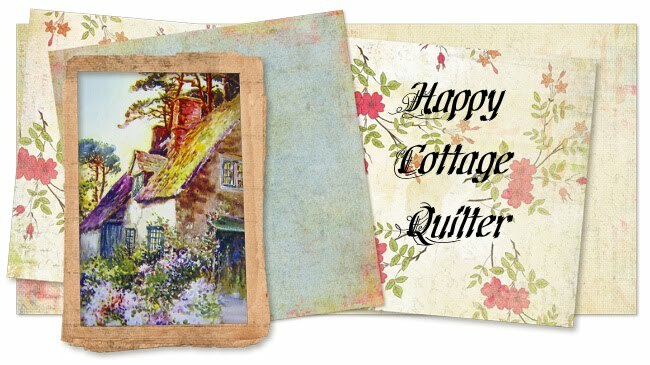 One prize from her giveaway were these cute little cottages! Aren't they great? I will be going through my stash to find something to make sashings. I love the little cottages. It makes me Happy! Also in my package was this really neat pin cushion. The embroidery is really well done. I love the little strawberries, and it is Strawberry season in our area now! Wow, thanks JoAnn! It was my first time winning a prize and you made it very worthwhile. My personal preference of fabrics usually runs in the Cottage florals, Kansas Troubles, Civil War Repo lines. But when my sister in love made an adorable baby quilt for her granddaughter, I felt that I needed to take the plunge. So I started with these cute butterfly prints. Then added some dots and pops. It was a very easy pattern, which is always a good thing for a quick little bonus quilt. I don't have any grandchildren, but some little munchkin will snuggle up with this bright cheerful quilt. Isn't this a happy spot? It is the cottage where my dear sweet husband grew up. There were 5 little acorns that grew there. They ran the woods and fished in the lake. Total childhood paradise on five little acres. There are very sweet memories of family gatherings. And as each one grew they did not wander far from this cottage. Two live on the same property and the others are very close by. I know a lot of people have difficulty with their in-laws, but I have been blessed with a family that I never had growing up. My mother in law has always been such an inspiration to me. She has a huge heart and the gift of hospitality. My father in law is a little on the quiet side, but has a sense of humor and a heart of gold. Guess that is where my own dear hubby got his. They are 88 and 89, respectively, and continue to show love to each other, even if only in the smallest of ways. In June they will celebrate 67 years of marriage. Not many marriages last half that long. Or one fourth that long. There were heartaches and disappointments, but they have hung on to each other through it all. As I watch this dear couple in these, their twilight years, try to hang onto their independence, as the zest for life is waning, I continue to stand amazed at their love for each other. And their sweetness of heart for their children, grandchildren, great-grands and friends. While attending a local Quilt show, I noticed wooden ladders made to display quilts. Some were very nicely done in the finest of woods. I didn't have the extra $$ to buy one on that day, but kept thinking how nice it would look in my cottage living room. When I came home, I decided to look in the garage for the old baby crib we had stored away. It was still in fairly good condition, even though it has been several years since being used. I cleaned up one of the rails and draped this quilt over it. This is the only quilt that I did not make myself. I found this one at an antique store, stuck way in the bottom of a shelf. The lady must have been anxious to get rid of it, because I asked her if she would take less for it, and she jumped at the price I submitted. It is a hand made quilt, although not old. But I liked the blues and thought it would go well in the cottage. Speaking of recycling things, Moda Lissa is having a drawing for her collection of Selvages. "I like to sew a piece of the selvage on the back as I am adding the binding. I then whip stitch it down to the back of the quilt. What does this do? Mainly it just helps me remember what collection was used in the particular quilt. I don't use this as the label but it does document the quilt for historians down the road." Also check out Karen (http://www.selvageblog.blogspot.com/) Griska as she is having a give a way too. See aren't quilters so clever and creative!! Remember my mentioning my sister in love giving me a gift certificate to the LQS for Christmas? Well this sil is a great quilter. She recently finished two Flea Market Fancy quilts. We found this scrappy pattern on crazy mom quilts blog site (http://www.crazymomquilts.blogspot.com/). I love crazy mom quilts. She is so creative and always has an interesting blog. I read her posts every day. This first picture has the backing showing. But look at how pretty her quilts turned out! What is this!!! Oh my that is my pile of Flea Market Fancy blocks, still waiting patiently for my attention. How is it that my sister in love can get two whole quilts completely done and I am still working on blocks?? The story of my quilt life! For Christmas, my sister in love gave me a gift certificate to a LQS. As I did not think the certificate should age, I visited the LQS on the last day of the month. On the last day of every month, if you purchase the end of the bolt, they offer 30% off. My plan was to scope out some fabrics to add to my ever growing stash, and maybe find some nice backing. While I was looking around, I saw this quilt on display. It was beautifully made with such pretty fabrics. Moda Kansas Troubles. I do not usually buy kits, so I did not even consider it (for the moment). It was a pattern I looked at once before when I saw it made up at a quilt show last fall. The kit, however, just kept calling to me. Hummm..... with the gift certificate, and a little extra I would have everything I needed except the backing. While I was at it, I found the backing fabric they had used in the sample. And you know what! There was just enough for the backing on the end of the bolt! Well you just can't argue with that reasoning. So this is the first time I will be using a Layer Cake. I hope I will be able to cut accurately and make this beautiful quilt. The Layer Cake is Moda Garden Inspirations by Kansas Troubles Quilters and the set in and backing fabrics are from the Merrimack Collection by Judie Rothermel (love her Civil War reproduction fabrics). They make a great duo. Pattern is "Slide Show" from Atkinson Designs. .... I was not going to cry!!! When I went to the library to borrow "Persuasion", I discovered that it was already checked out! Bummer..... Well I could check out something else to listen to in the car. I know, I wanted to get "Marley and Me" by John Grogan. I found the CD's and stepped into the check out line. As the librarian looked at what I had, she asked if I had read the book. I told her no, but that I had heard it was good. "You better get the tissues out, cause it will make you cry." Well before I even popped the first disc in, I told myself I would not cry. I mean it is a story about a dog..... I can handle that. So for the last week I have been listening to this story about a big yellow lab named Marley. Today I listened to the last disc. As I put it in the car CD player, I reassured myself, I was NOT going to cry. So I listened. And then it came......... the tears..... big loppy tears. It was not so much the sadness of the story's ending, but the overwhelming memory of my own little puppy. Who turned into a big lovable laggy Airedale dog~! She was my best friend. We had her before we had children. She was my buddy. My friend. Ten years and two children later, she left us. And oh..... what an ache in my heart. Even now as I think of her, the tears well up. How do we fall so in love with these critters and then they leave us!!! My love for her was so deep that I have never been able to have another dog. I felt that I could not do it again. Their life is so short. John Grogan said it well. There are just some animals that you never forget. They have left their imprint on your heart. "Flowers of true friendship never fade." Working on a baby quilt for my niece. Used only fabrics that I had on hand, however I did have to buy backing. Looks like a really good deal over at Superior Threads. It is a "try me" special. Looks like I can order different kinds of threads at a great price. Thought it was a good way to give them a try. It has been fun looking at other quilters blogs and seeing their collections of scissors and pin cushions. My collection has turned out to be -- project bags. It all really started so simply when I would find a pattern and fabric for the pattern. It only made sense to me to keep the fabric all together in a bag. It started in the bag from the LQS. They were pretty and sturdy. Some were purple, or pink, bright blue, red and even green. But then as I would collect fabrics for another project I wandered over to the plastic grocery bags (paper or plastic, mam?). Before long I was finding other bags to put projects in. The "green" bags from the stores worked great, and the free giveaway bags from the Quilt shows. How about those large oversized zippy bags. Then my dh came home with canvas bags from a convention he attended. These were even sturdier and had handles that could hold weight! Before I knew it, I was over run with project bags. My daughter had a very sweet roommate when she lived and worked in the windy city. For four years they worked and roomed together. When my daughter came home, there were many tears shed in the parting of the ways. Late last year, the roommate moved back home. I wanted to make her a quilt to thank her for being such a good friend to my daughter. She is a pink girl all the way. So I dug through my stash and found an assortment of pink fabric from my pastel days. This is what I ended up making. The quilt came out rather small, so I added the white sashing to make it a lap size. "Friendship is a long piece of work that, with faith, will never be finished."